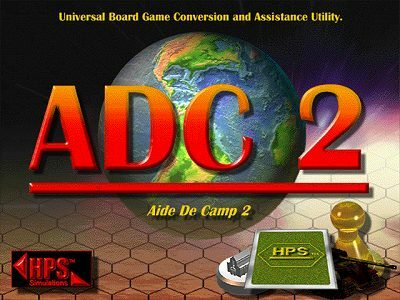 Aide de Camp2 (ADC2) is the long awaited sequel to the ultimate gamer's tool for converting all those old boxed games into a fully playable computer version intended for Play-by-E-mail (PBEM). While designed primarily for wargames, ADC2 is flexible enough to handle any game or application where moveable "pieces" are placed on top of some sort of schematic base. It can handle games as diverse as the complex wargame Grand Europa, to every kid's favorite Chutes and Ladders, or even Scrabble. Backgammon: one of the ready-made sets that comes with ADC2. ADC2 has can be used for non-game applications too, limited only by the user's imagination. Some of the more interesting uses we've heard of include wildlife resource management, astronomical star charts, a teaching aid for high school level anatomy classes, military map exercise, and even as a home improvement project planning tool. The system has built-in routines for common game-type functions, such as movement and combat. However, the program contains no AI and no functions to implement rules. You must own a copy of the board game in order to utilize ADC2 as a playing aid. Essentially, ADC2 allows you to convert any game from paper, cardboard or plastic into electrons.... so the game does not need to be physically set up. Once the set is created you can then play your turn, save the file and either send it to your opponent or "hot seat" on the same computer. All movement and combat are saved in a replay file, which can then be viewed by your opponent just as if he was watching a video of your turn. For those familiar with the original award-winning program, this new version has numerous significant upgrades. Stated Scott Hamilton, programmer and CEO of HPS, "this version includes several years of customer requests built into a new, Win95 based interface." 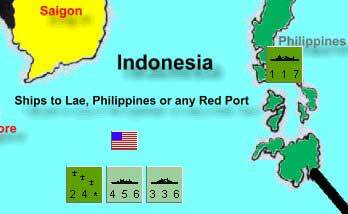 For example, with scanned maps, one can more easily recreate area games, such as this shot from the ADC2 gameset of Avalon Hill's Victory in the Pacific. Maps may contain up to 60,000 hexes or squares. This is over twice the previous capacity; dwarfing even the largest game yet designed, Grand Europa. Grids can be "true hexes", squares, or offset squares. Small squares allow for unconstrained piece placement, as with "area" games. Pieces can be assigned up to 16 editable characteristics/values, plus named and a hidden status. Over 30,000 pieces can be defined. Security passwords have been included for PBEM games. Support for 32-bit color depth. Single key "flip" command for flipping units to their back side. The ability to create sets for any type of game - area movement games, parlor games, even pure card games. ADC Includes a complex built-in user-defined LOS function for games that use Line of Sight, which can also be coupled with the hidden piece features to realistically recreate the "Fog of War". Need to use cards? No problem. ADC2 lets you create playing cards, decks and player hands as you'd like. Hidden units can be defined. A player's force can either be totally or partially hidden, with definable search ranges if desired. This will support "double blind" gaming systems. Force pools include a "random draw" feature...essentially allowing for "chit cup" drawing. Replay files can include .bmp graphic, .wav sound, and .avi video footage support. Map/Boards can be printed on paper or to a .BMP file. Map/Boards can now be imported as .BMP files (scanned in maps, for example). .BMP files can be imported when creating piece and map/board symbols. Unit facing can now be defined for 6 or 12 points. Text placement onto the map is fully adjustable for font, size, and text color. ADC2 comes complete with several sample games. HPS' Aide de Camp 2 is the standard for PBEM gaming - with sets for over 1000 games currently available. Click to view sets available from each (NOTE: these links leave the HPS web site, and will open in a new window). Visit Nick Bell's FREE HKL site for hints, tips, a list of commercial modules and to download hundreds of free ADC2 game sets. James Burnett's The Second World War: Storm over Europe, is an extremely impressive "Made for ADC-2" strategic level game of WWII in Europe. Visit his FREE site to download the complete game: ADC-2 gameset, rules, and charts. Miller Systems PBM WWII simulation: a moderated/umpired play-by-mail game using ADC2 for the map and unit display. NOTE: If using PKunzip you must use the -d switch to unzip the files into their proper folders. For example, type "pkunzip -d ADC2 Demo (CGW).zip". If using Winzip, click the "Extract" button, and check the "Use Folder Names" box. Once unzipped, run the program file: "ADC-2 Demo.exe". Click here to see screen shots of Area Movement games. Click here to see screen shots of Sci-Fi games. Click here to see screen shots of "Not" Wargames. Click here to see screen shots of games with Oversized/Shaped Pieces. REGISTERED owners of ADC version 1 (ADC1) can get ADC2 for a special upgrade price of $40.00. NOTE: The program documentation on the CD-Rom is in Windows HLP and Printable Document format - there is no printed manual included with the game. This allows us the ability to continually update and improve the manual with each enhancement of the program. Click here to download the latest free update patch and manual revision.